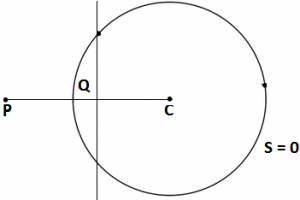 Let S = 0 be a circle with center C and radius r. two points P, Q are said to be inverse points with respect to S = 0 if. 2. If P, Q are a pair of inverse points with respect to a circle S = 0 then Q is called inverse point of P.
3. The inverse point of a point P with respect to a circle S = 0 is unique. Proof: Suppose the polar of P with respect to S = 0 meets CP in Q. Let S = x² + y² + 2gx + 2fy + c = 0 be the given circle. The polar of P with respect to S = 0 meets CP in Q.